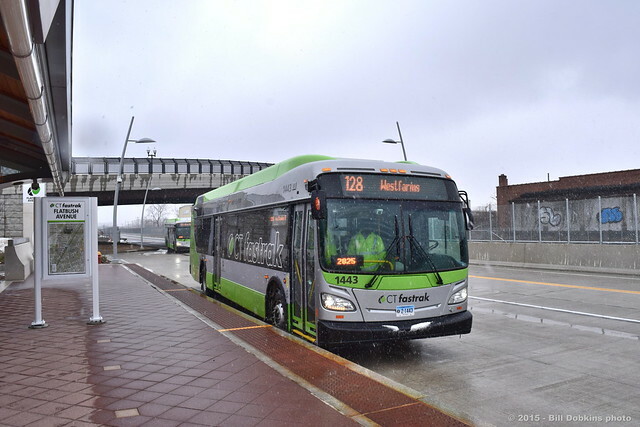 The CT Fastrak busway between New Britain and Hartford opened on Saturday, March 28th. Despite steady snow showers throughout the day, many people came out to ride the buses, which will be free until April 5th. 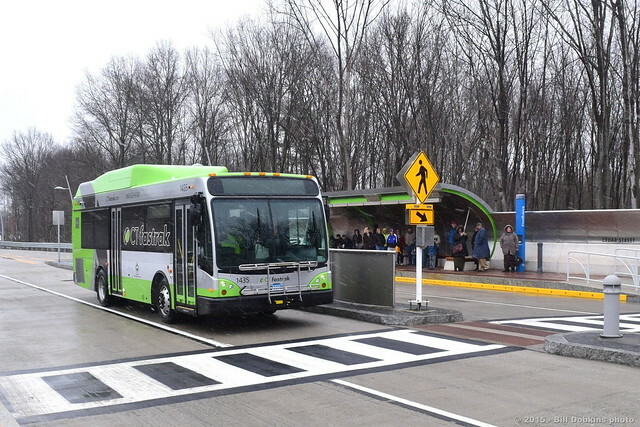 A variety of equipment is being used to operate the service, which includes a shuttle service along the busway, through local and commuter services and circulator routes to nearby traffic generators. Here are some pictures from the first day of operation. I'm glad to see some sort of shelter or roof at the bus stations. However, I recall my dismay at one of the earliest relocations of transit to the median of an expressway, namely what is now Chicago's Blue Line down the middle of the Congress Expressway. Travelers had and still have quite a hike to get to the station platform. They cross a wind-swept bridge, then walk a long ramp to the platform. I understand that some Fastrak routes do leave the busway and probably offer curbside pick-ups in the center of town. If Fastrak has 9 stations, how many of them require a walk of, let's say, 300 yards? Many thanks the informative items you often post. Most of the stations have limited or no parking and do require a walk of quite a distance, with exposure to the elements. Eventually, it is hoped that transit oriented development will spring up around many of these stations, so they will be more of a destination rather than an origin point. As you note, several Fastrak routes do extend off of the busway, serving major traffic generators and curbside stops in between. 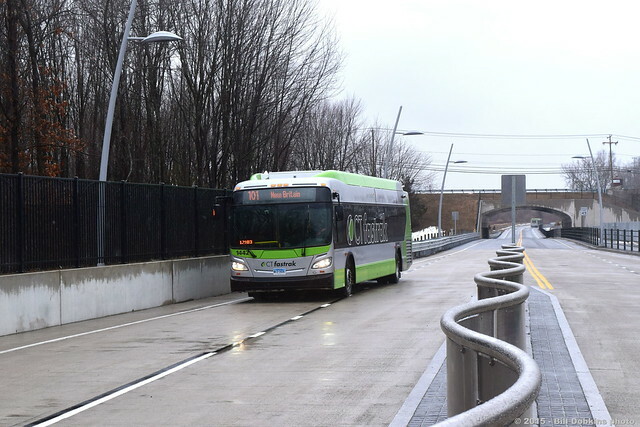 The busway facility and stations are beautiful and functional – I like the high platforms that line up with the various low-floor buses in use on this service. That said, many drivers were still tentative in lining the bus up with the platform and its rubber ‘bumpers’ (my term) that are meant to close the gaps between the bus and platform edge at the doorways. More than a few drivers slowed way down as they approached the platform and gingerly lined the bus up. The limited free parking at stations seems to be popular at some locations. We did take advantage on two days and there was only one spot available at the Cedar Street station when we arrived at midday. 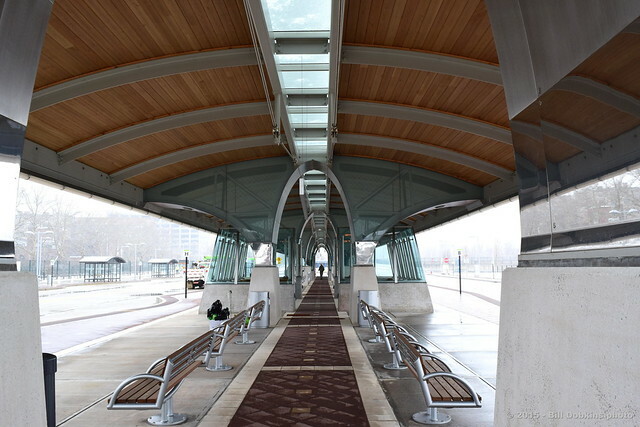 I will be curious to see if any private companies decide to build lots or garages adjacent to the busway to offer an alternative to Hartford’s notoriously expensive parking situation. The buses themselves are comfortable to ride in, although the ride along the busway was a bit bumpier in places than I expected for a new facility. I liked and used the onboard Wi-Fi. Also liked the onboard bicycle storage. The operators were generally friendly and helpful. We rode the NovaBus LFX’s and the New Flyer Xcelsiors – I wanted to ride a Gillig shorty but didn’t have the chance. 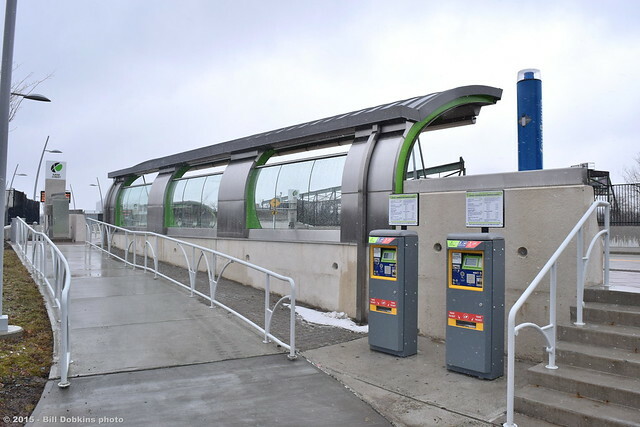 The fare machines at the busway stations were easy to use, as TVM’s go. The $3 day pass is a bargain. There was no onboard fare enforcement during our visit (I believe it just began this week), so I’ll be interested to see how prevalent they are on future visits. I think CT Transit has done the right thing in putting on a full level of service to encourage acceptance and usage of CTFastrak. Employees at major job centers are assured of service at all hours except the overnight when CT Transit does not operate. Ridership was decent during peak hours and on the main route 101 buses in general but light on some of the supporting routes that go off the busway. I suspect that routes like the 144 and 153 will need to be modified – hourly headways at all times are probably less useful than frequent headways at peak hours and no service at off-peak hours, IMO. The downtown loop is going to be a problem until the city and state bite the bullet and designate dedicated lanes for buses. 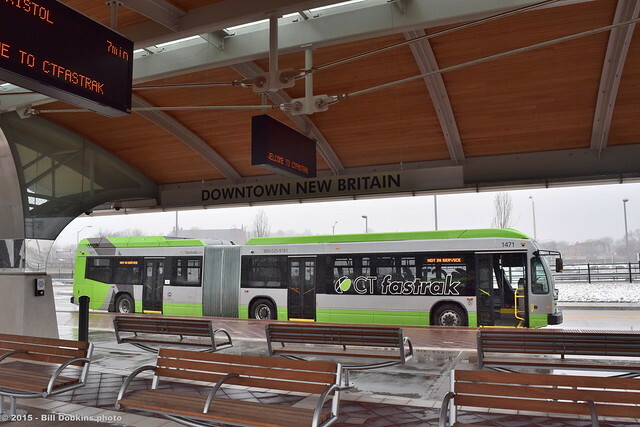 Heavy traffic on Main St. and Asylum St. during the afternoon rush hour put both CTFastrak and regular CT Transit buses behind schedule, with route 101 buses in particular falling badly behind schedule on one particular day and bunching together. 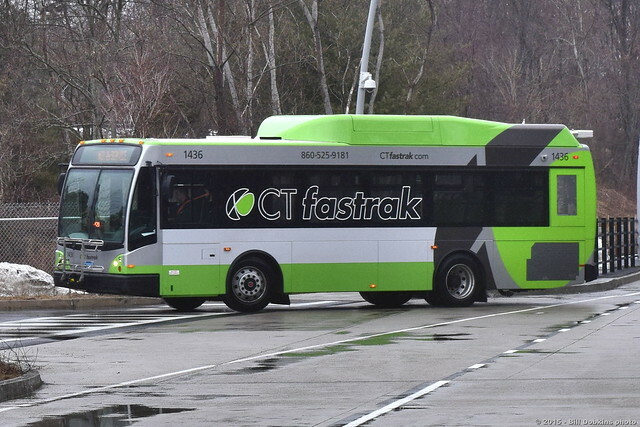 CTFastrak buses are also losing time due to the system’s current lack of a smart card fare payment system. Buses idled at stops at times because regular passholders have to validate their card at the farebox while a few others paid cash. Hopefully the eventual new smart card system will also feature card readers at all doors to eliminate these delays. 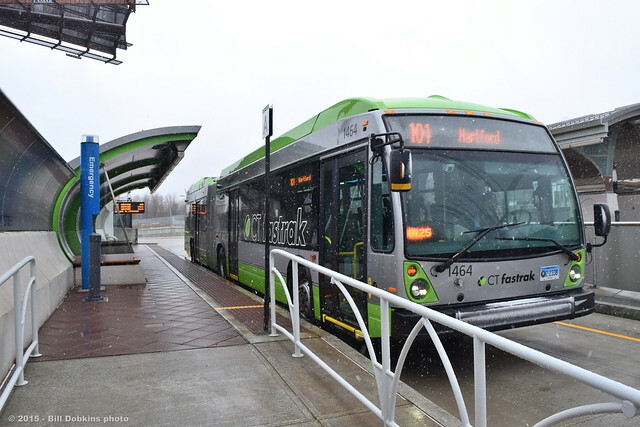 All in all, the CTFastrak system is very impressive and I’m rooting for its success.